Non Slip was awarded the Motor Industry Training Association of Western Australia Contract through Cooper and Oxley. The job consisted of 4000m² of training rooms and mechanical workshops. 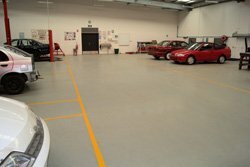 The floors were an epoxy based system applied as a self leveller with a minimal amount of slip resistance to make the surface non slip, yet easy to clean. The entire job was completed on time to the specified requirements, with no injuries or lost time.